333 p. ; 21 cm. A former talk-show host, a musician, a teenage girl, and a mother, each intending to commit suicide, find themselves together on the roof of a London building and begin to contemplate their individual choices and circumstances. 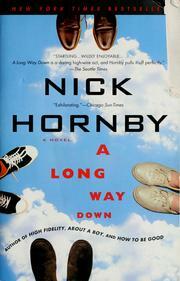 A long way down / Nick Hornby. 100 ME:PersonalName 1 $a Personal name Hornby, Nick. $c Statement of responsibility Nick Hornby. 520 Summary $a Summary, etc. note A former talk-show host, a musician, a teenage girl, and a mother, each intending to commit suicide, find themselves together on the roof of a London building and begin to contemplate their individual choices and circumstances.